Fifty years ago, the transistor was the size of a hand. In 1961, scientists predicted that a transistor could never be smaller than one-hundreth of a millimeter — but they were wrong. This is for June 30 — another landmark date in 20th century science. On today’s date in 1948, Bell Labs held a press conference to announce the invention of a new device — the transistor. The news met with little fanfare — the press didn’t pay much attention. Fifty two years later, we might cite today’s date as the beginning of the computer age. Transistors are used in radios, digital watches, calculators and video games – as well as the automatic control instrumentation used in spaceflight and guided missiles and, of course, computers. The first transistor was the size of a hand. Today, there are computer chips that contain more than a million transistors in an area the size of a pencil-tip eraser. A semiconductor is a material whose electrical conductivity — ability to let electricity flow through it — at room temperature lies between that of a conductor and that of an insulator. At high temperatures its conductivity approaches that of a metal, and at low temperatures it acts as an insulator. A transistor uses layers of semiconductors. Each layer has different types and amounts of carefully added impurities to control the flow of electrons. The materials most commonly used are compounds consisting of mostly silicon and germanium. 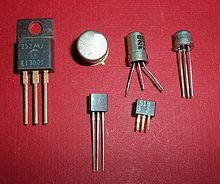 The single transistor was extended in the early 1960s by the invention of the integrated circuit. To compile an integrated circuit, many transistors are manufactured at once and permanently connected within a single silicon chip. The integrated circuit was originally thought to be useful only in military applications. The microprocessor’s investors pulled out before it was built, thinking it was a waste of money. The transistor is a key component of the microprocessor. The microprocessor is a small computer, often contained in no more than a few small semiconductor chips. It has many applications, including use in digital watches, microwave-oven controls, automobile emission-control and timing devices, video games, telephone switching systems, thermal controls in the home, security systems and, of course, in calculators and other types of computers. . It was the miniaturization of integrated semiconductor circuits in the 1960s that made the modern microprocessor possible. Techniques developed in the 1970s reduced circuit size and allowed for more complex circuitry – combining many electronic functions and large memory storage on a single chip much smaller than a postage stamp. Today, there are computer chips that contain more than a million transistors in an area the size of a pencil-tip eraser. It’s likely that there’ll be transistors at least twice as small within a decade — allowing computers to be much faster than they are now.